With the season opener just over two weeks away, manager Lloyd McClendon cut 11 players Friday morning, bringing the total number in major-league camp to 39. SURPRISE, Ariz. — With most of the Mariners’ 25-man roster seemingly locked in before spring training began, the rounds of roster cuts have been predictable as the team whittles the number of players in big-league camp. The Mariners optioned six players on the 40-man roster to Class AAA Tacoma — pitcher Lucas Luetge, catcher John Hicks, infielders Ketel Marte and Jesus Montero and outfielders James Jones and Stefen Romero. Notable: At Surprise Stadium, left-hander Roenis Elias made his fourth start of the spring and pitched four innings, giving up two runs and five hits with two walks and four strikeouts. … Reliever Tom Wilhelmsen gave up a two-run homer to Mitch Moreland. … Rangers reliever Alex Claudio was ejected after he hit Jesus Sucre on the back with the first pitch of the eighth inning. Home-plate umpire Ben May felt it was in retaliation for a couple of Rangers hitters who had been hit by pitches. … Mariners 2014 first-round draft pick Alex Jackson crushed a pitch over the wall in deep right-center for his first homer of the spring. Player of the game: Mike Zunino got a day off from catching to focus on his hitting as the Mariners DH. And he did plenty of hitting. Zunino blasted two home runs, giving him three this spring. Quotable: “One thing we’ve tried to stress to him, when you can stretch the field from foul line to foul line, you become a better and more dangerous hitter. It’s a work in progress, and he’s working on it.” — manager Lloyd McClendon, on Zunino’s approach at the plate. 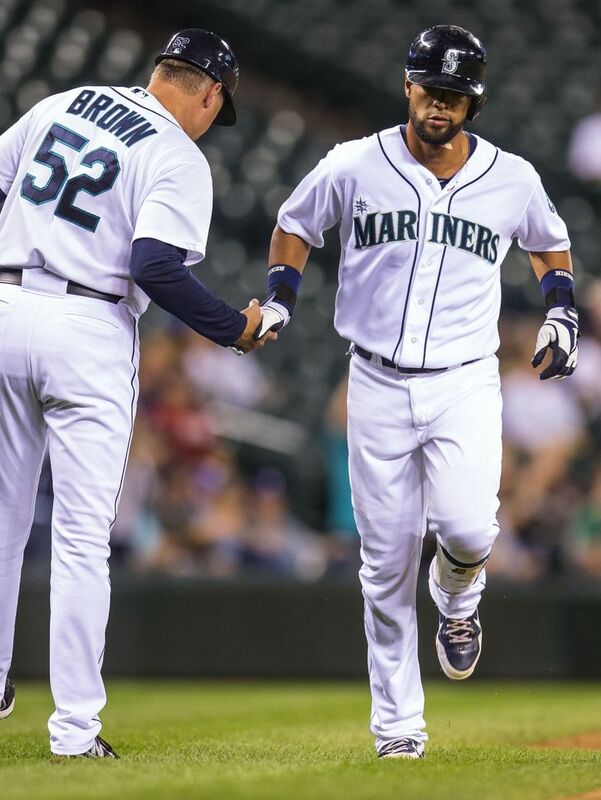 On tap: The Mariners travel to Sloan Park in Mesa to take on the Chicago Cubs on Saturday. M’s right-hander Felix Hernandez starts. Five players not on the 40-man roster were reassigned to minor-league camp: pitchers Justin Germano and Rafael Perez, infielders D.J. Peterson and Patrick Kivlehan and outfielder Franklin Gutierrez. Both Romero and Jones played extensively in the big leagues last season, appearing in a combined 180 games. From a roster standpoint, the race for the second left-handed reliever has been whittled with Luetge and Perez being cut from camp. That leaves David Rollins, Tyler Olson and Joe Saunders competing for that spot. Back-to-back bad outings against the Indians and Rockies hurt Luetge’s chances. Perez allowed six runs and nine hits in 42/3 innings. About a week ago, McClendon said he felt there was a pitcher capable of handling that spot in the group competing for the job. Has that changed? Montero and Gutierrez were nice stories entering camp. But neither was likely to make the team. Montero lost 40-plus pounds in the offseason and looks like a different person. But he also needs to become a different player on the field. He needs to work on his swing and become consistent with his approach. His defense at first base is improved but remains a work in progress. Gutierrez knew he was not going to make the team after missing last season while dealing with health issues. A groin issue has cost him much of this spring, as he hasn’t played in a game since March 7. When he signed his minor-league deal, he understood he likely would start the season with Class AAA Tacoma. For Mariners prospects such as Peterson, Kivlehan and Marte, they knew making the team would be a longshot. But they got to perform in front of the big-league staff, which is important. Peterson homered in his first at-bat this spring. But there were some struggles along the way. He hit .161 (5 for 31) with the homer and three runs batted in. Kivlehan hit .350 (7 for 20) with a double, a homer and four RBI. After some early struggles in the field, Marte settled in and hit .304 (7 for 23) with a double and triple. The Mariners saw yet another tantalizing hint of the powerful potential of Alex Jackson. The team’s 2014 first-round draft pick played in his second consecutive Cactus League game Friday. On Thursday night, he got a hit in his first at-bat — a broken-bat single to left field. On Friday at Surprise Stadium, Jackson got another first in a big way, hitting his first home run. Jackson crushed a fastball from Rangers reliever Shawn Tolleson well over the wall in deep right-center. The sound off the bat and laser trajectory made the home run a no-doubter. But Jackson made no such assumptions. It was a gasp-worthy, opposite-field blast that displayed power that some major-league players don’t possess.